Facts about Gladiator Butterfly, "Scientific name for Gladiator Butterfly is Hypolimnas dexithea". The Gladiator Butterfly has five bright colors. The Gladiator Butterfly is a member of the Nymphalidae family and Nymphalinae sub-family, but it is one of the larger members of the Hypolimnas genus. It is a member of the Junoniini tribe of species (this group is larger than the genus). The Gladiator Butterfly is part of the super-family papilionoidea and sub-order ditrysia. It is part of the order Lepidoptera, the order for butterflies. A Gladiator Butterfly are insects. A Gladiator Butterfly is a herbivore; Meaning that as a caterpillar its first food is its own eggshell and than it will eat the leaves of the plant on which it is hatched. When it becomes a butterfly, it will feed mostly on nectar from flowers, rotting fruit and water with a "proboscis" - a long narrow tube in their mouth that looks like a straw. 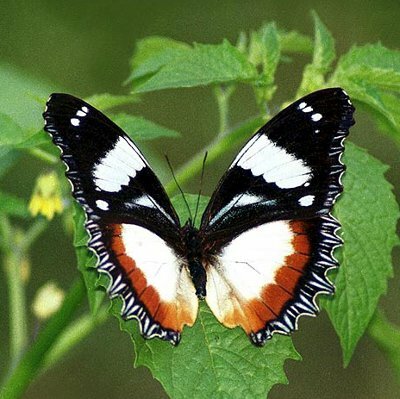 The gladiator butterfly has black and white forewings. A light blue stripe emanates from the body to the middle of the forewing. The Gladiator Butterfly has red or orange bordered hind wings with a white dot in the middle. The hind wings have internal and precostal veins. Both sets of wings are bordered in black and white. Gladiator Butterfly's wing shape is somewhat unique, with a spiked pattern all around, similar to a swallowtail but not just on the back of the hind wing. Along the margin is a row of small white spots. Sometimes near the body there is a white spot. The wing span is four inches (10 cm). The Gladiator Butterfly bodies are black on top and brown on bottom. The underside of their wings retains the white patterns but is a more muted blue. The white stripes on top are more muted and even reduced in size when looking up from the bottom. Its antennae have two groves on the under-side. A Gladiator Butterfly is cold-blooded, which means the body temperature is not regulated on its own. A Gladiator Butterfly can't fly or eat if their body temperature is below 82 degrees fah (28 cel). Gladiator Butterfly's are often basking in the sun with their wings open to gain heat and than the veins in the wings carry the heat to the body. The Gladiator Butterfly is native to Madagascar. Its range is so small that there are no subspecies. While the Gladiator Butterfly lacks the larger range of many species, it is not on the IUCN red list of threatened species or prohibited list for the Convention on International Trade in Endangered Species of Wild Fauna and Flora. The Gladiator Butterfly lives in the Afrotropic ecozone but is only found in Madagascar or on display as part of a collection. Due to the Gladiator Butterfly bright colors and vivid contrasts, this species was targeted by collectors soon after its discovery. They are still collected today, and paying for them depending on quality. There is a Lepidoptera Breeders Association in England that breeds the Gladiator Butterfly species and others to help avoid extinction. The Gladiator Butterfly species was first described by Hewitson in 1863. The Gladiator Butterfly is a brush footed butterfly, also called a four footed butterfly. This term originates from the shorter pair of front legs that make it look like it has only four legs instead of six. The Hypolimnas genus, also called the diadems or egg-fly genus, is known for mimicking the Danainae or poisonous milkweed species. Hence the Hypolimnas species will usually mimic the Danainae species in the area that is poisonous, if one exists. However, the Hypolimnas species is not itself poisonous; the mimicry simply dissuades predators. This is called Batesian mimicry. The caterpillars are hairy. The chrysalises have shiny spots. Not much is known about their preferred food plants or the larval life cycle. The Gladiator Butterfly species doesn’t migrate with the seasons, though their numbers increase after monsoon season due to increased availability of food. The gladiator butterfly species does have differences between male and female. For example, the female’s antennae are shorter. The top flight speed of a Gladiator Butterfly is 12 miles per hour and some moths can fly up to 25 miles per hour. A Gladiator Butterfly has a small body, made up of three parts – the head, abdomen and thorax. A Gladiator Butterfly has two large eyes, which are made up of many small parts which are called "compound eyes". A Gladiator Butterfly has two antenna's on the top of their heads, which they use to smell, hear and feel. A butterfly’s mouth is a long tube a "proboscis" - a long narrow tube in their mouth that looks like a straw when its done eating, it rolls the tube back up. A Gladiator Butterfly has three pairs of legs and their feet have little claws that help them stand on flowers. The Gladiator Butterfly's wings are made up of hard tubes that are covered with a thin tissue. The Gladiator Butterfly's wings are covered with fine dusty like scales. A Gladiator Butterfly has four brightly colored wings having distinctive patterns made up of tiny scales. The bright patterns scales sometimes have hidden ultraviolet patterns for attracting mates. The bright colors are also used as camouflage to hide them or scare off predictors. Life cycle of a Gladiator Butterfly comes in four stages, egg, larva "caterpillars", pupa "chrysalis" and adult Gladiator Butterfly. A Gladiator Butterfly will attach its eggs to leaves with a special glue. An adult Gladiator Butterfly will come out from the "chrysalis" than it waits a few hours for its wings to dry and fill with blood, before it takes its first flight.